These nursery must-haves need to be on your new baby registry. Just click on photos and/or product names to find out where to purchase. 1. 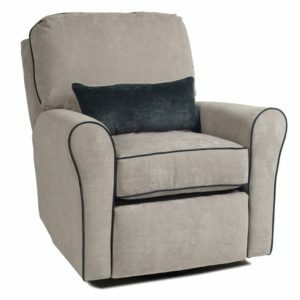 Little Castle Cottage Recliner – This recliner/glider (which we customized in the charcoal riviera fabric to match our nursery) is arguably the centerpiece of our nursery. 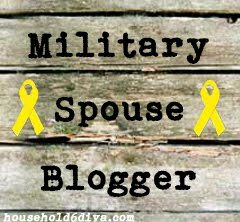 Check out why we can’t live without it! 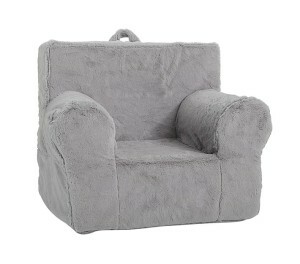 Bonus: After we’re done with babies, this chair will fit right in in our family room, library or office! 3. 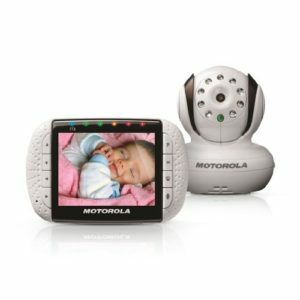 Motorola Video Monitor – Last Christmas, my sister bought a cheap, old video monitor off a buy/sell group to keep at my parents’ house for our new babies. Well…consider me bitten by the bug. I love seeing what my little girl does before falling asleep for the night (note: she sits up for a while looking around, then face plants onto her pillow and pets her Lamby’s ears until she falls asleep). That’s why I put this highly rated, quality, color, two-way video monitor on my registry for baby number two. Do I need to watch him sleep? Nope. Have I earned the luxury? I think so. 4. 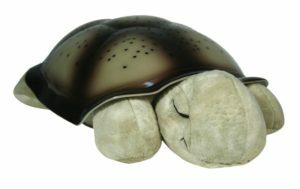 Twilight Turtle – Who would have thought that one of the first things we put into our baby’s nursery would end up being essential to our nighttime routine!? When Madeline was tiny, I used to light him up when I changed diapers in the dark (purple was the best and brightest, without being too startling). For twilight feeds, I’d light him up amber- soft and soothing. Now we light him up each night before tucking Maddie in as a nightlight (he turns off automatically). He’s so clutch that we even bought the new baby his own for his nursery. 5. Pottery Barn Kids Larkin Crib – We went with Pottery Barn furniture because we knew we’d have more than one child and wanted to be able to pass it down. The quality of their furniture can’t be beat. We also saw the crib as an investment. We went with a convertible crib so that we can eventually convert it to a full-sized bed for our final baby, which will hopefully last until they move out. 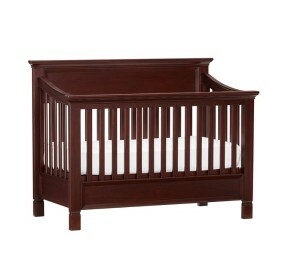 We decided on the classic, unisex, dark wood Larkin (but many of the PBK convertible cribs could work well into your children’s adolescence). 6. 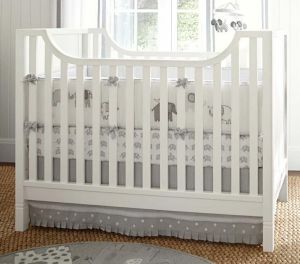 Pottery Barn Kids Lullaby Crib Mattress – PBK crib means we went with the PBK crib mattress for a perfect fit. 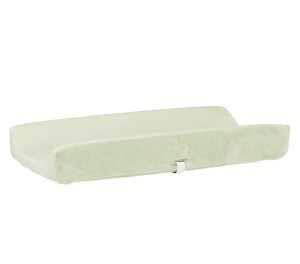 This one is dual-sided- firmer for a newborn and softer when you flip for toddlers. Also, it wipes down easily when you’re changing the sheets. 7. 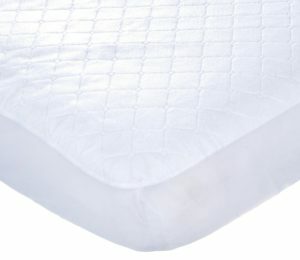 Fitted Waterproof Crib Pad – My best friend (a mom of two) told me to register for two of these. She suggested we set up the bed with both sets (pad+sheet) on, so when liquids happen in the night, all you have to do is whip off one and the other is there and ready to go. To this day I don’t know how she ninja-ed two sets onto her mattress (one is already a super snug fit). But you do need two of these, so you have a second set available when the first goes straight into the wash.
8. Pottery Barn Kids Bedding – The best advice I can give when it comes to registering for bedding? If you plan on having more than one baby and can help yourself, buy gender-neutral! That way when baby number two (or three or four) comes along and you finally get that boy, you’re not shelling out money you could be using to buy a new baby wardrobe on new bedding. We went with gray, white and green linens. With a pink accent wall, it was perfectly sweet for our girl baby. With a navy blue accent wall, it has found an equally fitting home in our boy baby’s nursery. 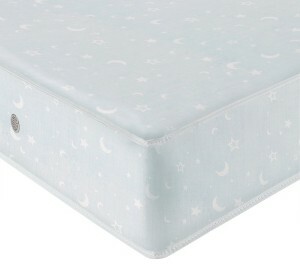 Register for two fitted sheets and a crib skirt. 9. 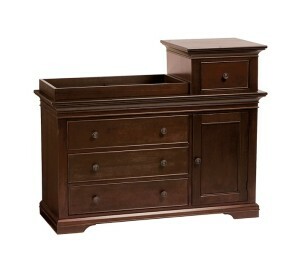 Pottery Barn Kids Larkin Hi-Lo Changing Table – We registered for the matching changing table/dresser to our crib. The topper drawer is great for keeping diapers in, the cabinet holds a small trash can and the three large drawers are just the right fit for all of baby’s current clothes. We love it. Right now. However, I think we might have been better served in the long run if we had gone with the extra wide dresser and topper– more drawer space for a child’s growing wardrobe. Look into either of these options for your registry. 10. Pottery Barn Kids Changing Table Pad + Cover – We are definitely changing table people (we still change our two year old on a changing table). This changing pad and cover is comfortable, washes well and is really another great way to add to the detail of your theme or color scheme in your nursery. There are tons of beautiful patterns to pick from at PBK (we have ivory in Madeline’s room and blue in the new baby’s room). 11. Oxo Tot Hamper – My love for Oxo Tot products knows no bounds. When I found their modern, chic, sturdy hampers I knew I needed one in our new baby’s nursery. I’m so excited to let big sister help slam dunk some of her baby brother’s dirty laundry! 12. 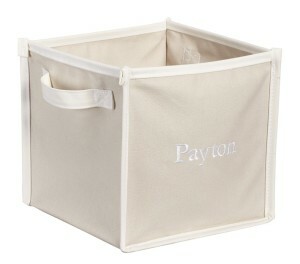 Pottery Barn Kids Canvas Storage Bins – There aren’t a lot of problems a good canvas storage big can’t solve. 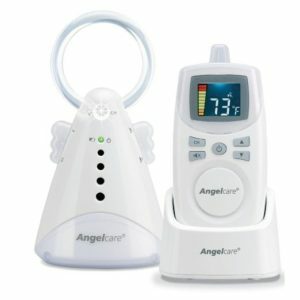 We registered for five of these and used them to keep clothes in up on a shelf in the baby’s closet. 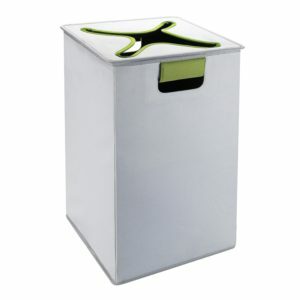 Once they outgrow that use, these bins make great toy storage! 13. 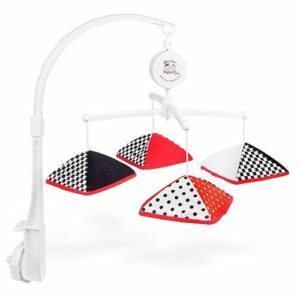 Musical Infant Stimulation Mobile – We didn’t register for a mobile, because I made my own. But if I’ve learned one thing as a new parent, it’s to never look a gift horse in the mouth. My Grandma knew what she was doing when she sent us this musical mobile. It has two-sided cards for baby to gaze at while laying in the crib- black/white/red patterns on one side and childrens’ faces on the other. Both kept Madeline’s attention at a very young age (2-3 months, if memory serves) and definitely helped her hone her inner baby genius. The nice lullaby it plays was a bonus! 14. Pottery Barn Kids Anywhere Chair – The pint-sized comfy chairs are awesome for your little one to snuggle up in with a good board book (like Little Pookie). 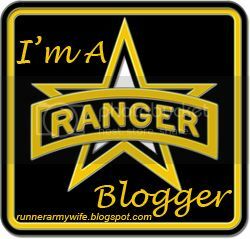 Read more about why we can’t live without it and find out how I scored an awesome deal on ours. 15. Jasper and Ruby Nursery Art – I know all art is subject to taste, but I figured if you like any of my other nursery recommendations, you might like this one, too! 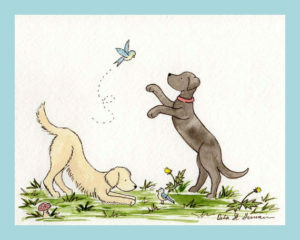 These sweet little watercolor animal prints are from one of my favorite Etsy shops- Jasper and Ruby! Maddie girl has elephants and puppies in her room and the new baby has a moose and black bears in his. Before he’s born, I’ll probably add foxes and hedgehogs to his collection, to round out his soft wilderness theme. I don’t think I’ll be able to help myself!